Rotating the light switch turns the lights on and off, regardless of the power mode setting. Turn the lever to OFF either when: • The shift lever is in . To turn the lights on again, turn the lever to OFF to cancel the lights off mode. Even if you do not cancel the lights off mode, the lights come on automatically when: • The shift lever is moved out of . • The vehicle starts to move. If you leave the power mode in VEHICLE OFF (LOCK) with the lights on, a light on reminder chime will sound when you open the driver’s door. Your vehicle is equipped with the automatic headlight adjusting system that automatically adjusts the vertical angle of the headlights. 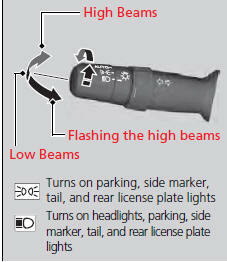 If you find a significant change in the vertical angle of the headlights, there may be a problem with the system.